You might not think of fish or seafood when you think about dishes to cook in your slow cooker, but there are many excellent options. Because long, slow cooking will toughen fish and shrimp, they aren't added until the last 15 minutes to 1 hour of cooking time. A soup or gumbo, for instance, is cooked in the crock pot for a long period of time with the sausage and chicken, while the shrimp is added about 20 minutes before serving time. In general, check fish and seafood for doneness with a fork after about 15 minutes. Shrimp should be tender and opaque and fish should flake easily with a fork. Surprisingly, the slow cooker is an excellent salmon poacher. Line the slow cooker with foil or parchment paper. Cover about 1 or 2 pounds of salmon fillets with lemon slices, herbs, and your favorite seasonings. Place the fillets in the slow cooker and add a cup of wine, water, or broth to the pot. Cover and cook on low for 1 to 2 hours. Check the salmon with a fork after about 1 hour and about every 15 minutes after that. It should flake nicely and will be about 145 F on an instant-read thermometer when done. Unless you are following a specific recipe, delicate fish such as tilapia, sole, and flounder should be avoided. Slow Cooker White Beans With Tuna This preparation makes a tasty meal with rice, or chill the beans and add the tuna and tomatoes for a delicious tuna and bean salad. Crock-Pot Scalloped Potatoes with Salmon Canned salmon is cooked with sliced potatoes and condensed soup in this easy, convenient dish. Crock-Pot Tuna Casserole Top this easy casserole with crushed potato chips or bread crumbs. Crock-Pot Shrimp Creole Serve shrimp Creole with hot cooked rice or pasta. The combination of vegetables, tomatoes, and shrimp is classic New Orleans fare. Crock-Pot Jambalaya This is a combination of chicken and smoked sausage with tomatoes. Shrimp and cooked rice are added near the end of the cooking time. Slow Cooker Chicken and Shrimp with Fettuccine Another tasty combination, the chicken and shrimp mixture is served over hot cooked fettuccine. Slow Cooker Shrimp Marinara Sauce This marinara sauce is a snap to cook in the slow cooker. Serve with hot cooked spaghetti or linguine. Slow Cooker Garlic Shrimp The slow cooker makes this garlic shrimp dish a snap to prepare and cook. Just combine the sauce ingredients, add the shrimp, and push a button. Slow Cooker Sweet and Sour Shrimp Snow peas, pineapple, and ginger season the shrimp in this tasty sweet and sour shrimp. Serve it with hot cooked rice. Crock Pot Chicken and Sausage Gumbo This Creole favorite is a natural for the slow cooker. Crock-Pot Clam Chowder This is a great way to make a clam chowder. The milk or cream is added near the end of the cooking time. 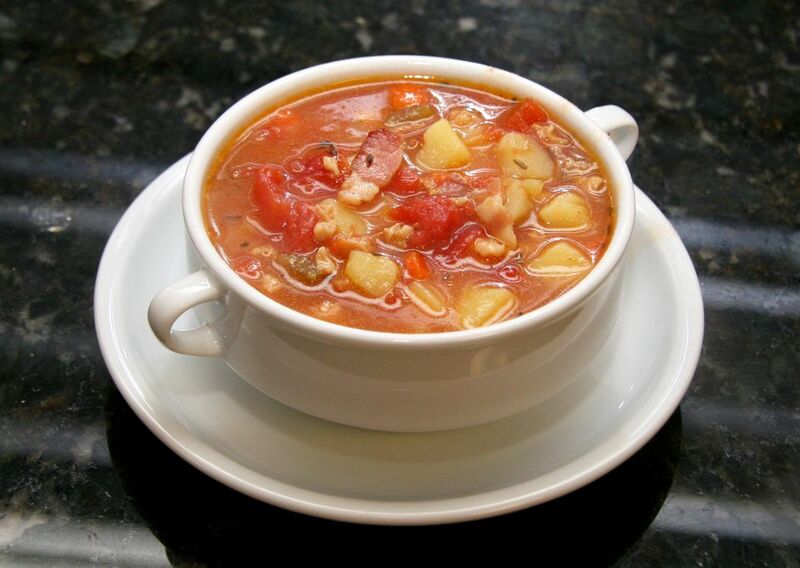 Manhattan-Style Clam Chowder This is one of my family's favorite clam chowder recipes. Bacon, clam juice, and tomatoes give it fabulous flavor. Crock-Pot Fish Chowder Make this easy slow cooker fish chowder with haddock, cod, or catfish. Will's Fisherman's Stew Will's stew is full of flavor with shrimp, fish, scallops, mussels, and clams.